Why did Tom Brady’s personal chef say in a recent interview that “white sugar in the death of people?” The list of sugar health risks is long, but isn’t everything O.K. in moderation? The “everything in moderation” touchstone is true as long as we also don’t mind dying in moderation. According to a 15-year study, the risk of death from heart disease rises in tandem with the amount of sugar in the diet. That means people who eat only a little added sugar still have elevated risk. Added sugar then really does equate to death. The question is how much death we actually want: a little or a lot? According to a 15-year study, most Americans eat at least 10% of their calories as added sugar. For one in ten people, refined sugar makes up a staggering 25% of what they eat. Sugary drinks and sodas mainline the white death into the typical American bloodstream, but even so-called healthy foods like protein bars and yogurt deliver pounds of added sugar. Worse still, people with 25% sugar in their diets faced double the risk of dying from heart disease as those who ate half as much. It’s easy to raise our better-nutrition-than-thou eyebrows at those poor, deluded, over-sugared souls. But an even more shockingly, typical Americans with lower 10% sugar diets still had double the risk of those who ate half as much. In a nutshell, the more added sugar, the higher the death risk from heart disease. The less added sugar, the lower the heart disease death risk. Ready to cut out sugar and go all the way with healthy foods? See our full guide to the Tom Brady diet plan. Cancer. Everything causes cancer, right? Several studies have now shown added sugar joins the pack. The more sugar, the higher the risk of death from cancer. Obesity. Sugar heads the “most wanted” list when it comes to obesity. Those who drink soda and other sugary drinks have a 60% higher obesity risk. 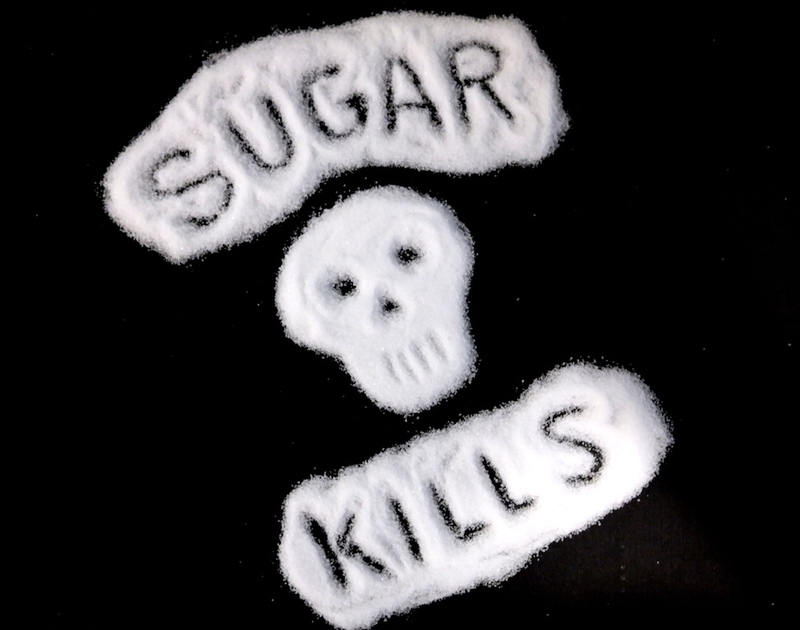 Since 25% of all death is plugged straight into obesity, it’s another huge way sugar kills. Liver damage. Sugar can clog the liver with fatty buildup. That fat reduces the liver’s efficiency and can lead to diabetes. In fact we know know sugar is as bad for the liver as alcohol. Diabetes. Even one can of soda per day can raise diabetes risk. The body loses its ability to process sugar, which then turns as toxic as drinking runoff from Fukushima. In fact the blindness associated with advanced diabetes comes from sugar toxicity. Addiction. Sugar makes the brain turn on the dopamine fire hose. That’s the same pleasure pathway fired up by cocaine. Some people actually form strong sugar addictions that lead to all the paths to death listed above. With heightened risks of all the fatal sickness shown above including heart disease, cancer, liver damage, diabetes and more, it’s no wonder sugar has been called “the death of people.” If a person served up this many ways to die we’d lock him up and toss the key out of a plane. Need to drop a few pounds fast? See this guide to the popular military diet plan. For a longer term weight loss option, look at this guide to the ketogenic diet.